I recently had the opportunity to interview Neil Sagebiel, the founder of Armchair Golf Blog and esteemed author of two books, The Longest Shot and Draw in the Dunes. Read some of Neil’s thoughts on golf and learn more about his fascinating books in the transcript below. Me: I know you’re a busy guy. Thanks for making time for this interview. I want to start by asking you how you became connected to the game of golf. What’s your golf story? Neil: I started playing when I was about 12, not long after we moved to California from Indiana. My dad was a golfer. I tagged along and got the bug. When I was a ninth grader, I went out for the high school golf team. We were terrible, but got better. I played all four years. I spent much of my summers playing golf at our local 9-hole course. Me: You’ve been managing the Armchair Golf Blog since 2005. In just over ten years, you’ve contributed nearly 3,000 golf posts, which is quite impressive. How do you find the time and energy to post so regularly? What are your favorite golf topics to write about? Neil: Two things help me keep the blog going. One, I’m self-employed, so I have a lot of freedom to manage my schedule. Two, I’m a writer, professionally. I think that makes it a bit easier to write and edit content. It’s what I do. My favorite topics are writing about players, tournaments and golf history. I also enjoy the occasional oddball story. Me: Over time, the Armchair Golf Blog connected you to Jack Fleck, the dramatic winner of the 1955 U.S. Open. Can you give us some backstory on this meeting and your decision to write your first book? Neil: Neither were planned, but rather happened as an outgrowth of the blog. About this time in 2007, a reader suggested I call Jack Fleck, and even gave me his phone number. I was excited about talking to a golf legend, so I picked up the phone. I had no plan, but it didn’t take me long to realize his amazing upset story hadn’t been fully told. I had always wanted to write a book and decided to step up to that challenge. Me: When I think of inspirational sports stories, basketball or football stories are often the first to come to mind. Thanks to you, Fleck’s 1955 win over his childhood idol has been added to my mental list. Can you give readers a brief glimpse into this remarkable victory? Neil: It’s David vs. Goliath, a classic underdog story. Jack Fleck had never won a tournament on the PGA Tour and had only qualified to play in the U.S. Open twice. Ben Hogan was the best player of that era and had won four of the previous seven U.S. Opens coming into 1955. 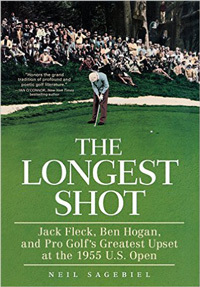 No one would think Fleck had even the slimmest chance against Hogan, but somehow he rallied to tie Hogan and then the two men went head-to-head in an 18-hole playoff. The drama, the twists and turns of the whole story, well, you just couldn’t make it up. Me: What did you learn from writing The Longest Shot and what led you to pursue your second book, Draw in the Dunes? Neil: I learned to write a narrative, for one thing. I had success with my research and was able to reach out to and interview golf legends. This definitely helped me a lot with putting together the second book, which also focuses on a great event, the Ryder Cup, and a historic moment in the game. Me: You’ve had the unique opportunity to speak with a number of golf legends. Who were your favorite golfers to talk to? Any helpful insights or fun stories you’d like to share? Neil: I spent a lot of time with Jack Fleck, which was a great experience. I’d say it turned into a friendship. Through him, I had access to many others. Spending time with Tony Jacklin and Jack Nicklaus was a huge highlight of writing the second book. It was also great to talk to many of the other British players of that earlier era. Many of those conversations were telephone calls across the Atlantic. Me: Any thoughts on the state of golf in 2016? Neil: In terms of tournament golf, the PGA Tour and such, I feel the game is on a good path. The players are exceptional and there are several new stars that attract interest. In terms of participation, the game seems to be evolving in order to survive and appeal to younger generations. I hope it succeeds without straying too far from the game’s traditions. Me: Should we be expecting another golf book from you down the road? Neil: Not anytime soon. I do want to write more books, though. There’s a very good chance the next one won’t be about golf. Of course, I will keep writing about golf at the blog. I’d like to extend a big thank you to Neil for sharing his thoughts.